Since the death of Freddie Gray last April and the protests and unrest that followed Baltimore’s Police Commissioner Kevin Davis has talked about the changes the department needs to make to improve relations between the police and the citizens in the city. Last fall, in an interview for "On the Watch," then relatively new Commissioner Davis said police needed to move away from "zero tolerance" police tactics and show their "human" side. "We train people for six and half months for the very worst case scenarios in our profession," Davis said. "The gunmen, the domestic violence scenario, the foot chase, the crime scene investigation, the interviews and interrogations." Those are just as important as they always have been, he said, but the police "don’t do as good a job as we should to just have relationships with people." "Throughout a police officer's day, and it can be in the most challenged part of the city, we deal with far more people who just want to speak to an officer. We have to do a better job of that." Usually, officers fresh out of the police academy are the cops on foot patrol or "walking foot," as it’s often called. But Davis wants to change that. Baltimore Police officials want officers to connect with citizens when they’re not in a crisis situation – this, they hope, will "build relationships". And so throughout this year, veteran officers will complete an eight hour "refresher" course in foot patrol. They’re expected to walk foot during their ten hour shift "when feasible," according to Lt. Jarron Jackson, a spokesman for the Baltimore Police Department. Officer Zachary Novak, who was involved in the Freddie Gray case, has been on the force for about four years. "If you were to ask people what they want," he says, "it’s bring back 'Officer Friendly' and more foot." Novak testified in the trial of Officer William Porter that he called for a medic and tried to revive Gray himself when he arrived at the western district station. Novak is a patrol officer in the western and has been since he became a cop. He says in his "dream world" he would have an assigned post and walk that beat constantly. But a steady flow of 911 calls has him chasing the radio and responding to emergencies. "The ability to get out and engage with citizens is pretty limited. We're responsible for a pretty big area," he says. "The issue is staffing...when I came on, we had a sufficient number of officers." 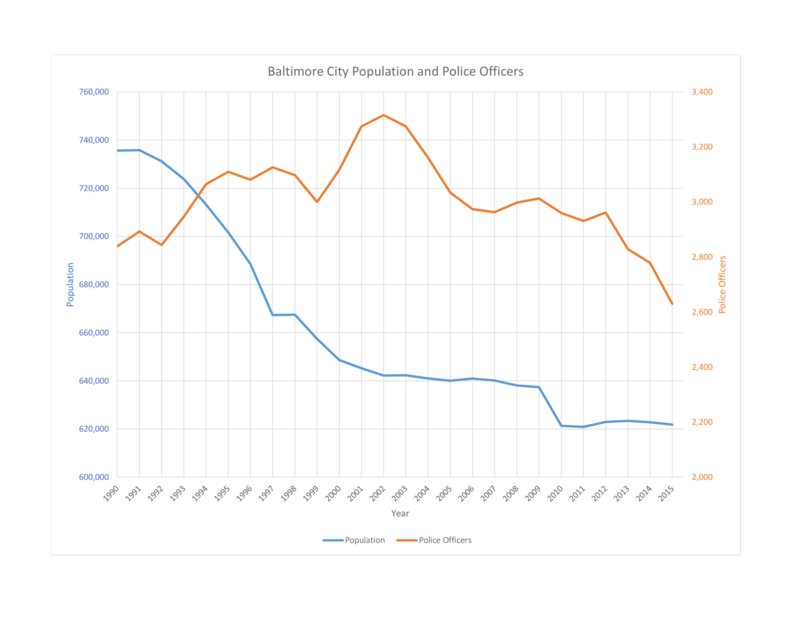 In fact, there aren't as many officers as there used to be, even with the fluctuating population of the city. In 2012, Baltimore was among the top cities with the greatest police presence nationwide. But last year, according to the FBI’s Uniform Crime Report, the Baltimore Police Department had one officer for every 236 citizens. That's highest ratio of officers to citizens in twenty-two years. Besides a dip in the ratio of cops to citizens, experts say Baltimore's approach to foot patrol has a few other holes. Jerry Ratcliffe, a professor of criminal justice at Temple University, was a lead researcher on the 2009 Philadelphia Foot Patrol Experiment and is a former London cop. "Generally, places that have done it successfully have dedicated officers for the entire shift rather than just asking officers to get out of their cars every now and then," Ratcliffe says. The Philadelphia experiment showed that having permanent foot patrol officers was key; that younger officers have much more success than veteran cops. And then, having the right officer tasked with the foot patrol duty was crucial. "Police officers have different skills in different areas," Ratcliffe says. Some officers have a knack for spotting crime on the streets, others excel at data analysis, but "foot patrol is another activity" and not every officer is suited to it. Foot patrols can be used for a number of reasons, he points out. When done effectively, they can "build relationships" but they have been proven to reduce crime as well. In Philadelphia, there was a 23% reduction in violent crime in the areas where foot patrols were conducted. But, he says, pedestrian stops increased by 64%. For many citizens worried about profiling in high crime neighborhoods and officers' excessive use of stop and frisk, this increase in pedestrian stops is a great concern. Baltimore's homicide rate rose last year while fewer cases were reported solved. In 2015 the homicide rate rose more than 60% from the previous year. In 2014 there were 211 homicides reported. The number in 2015 was 344. At the same time fewer homicide cases were reported solved. The percentage of homicides solved by the police is called the clearance rate. Last year, Baltimore saw its clearance rate drop from 57% in April to 40% in June and then it dropped to 30% in August which is where it hovered for the rest of the year, an arrow pointing in the wrong direction for the city. On The Watch Part 5.